In the early texts of physical yoga, inverting the body was considered to be a mudrā. The term mudrā means 'seal' and it can be understood in the context of yoga to seal (i.e., stop) the downward flow of nectar (amṛta) from the head to the abdomen. The aim of retaining the nectar in the head was to prolong the lifespan of the yogin (for more details, see Haṭhapradīpikā 3.78 - 82). 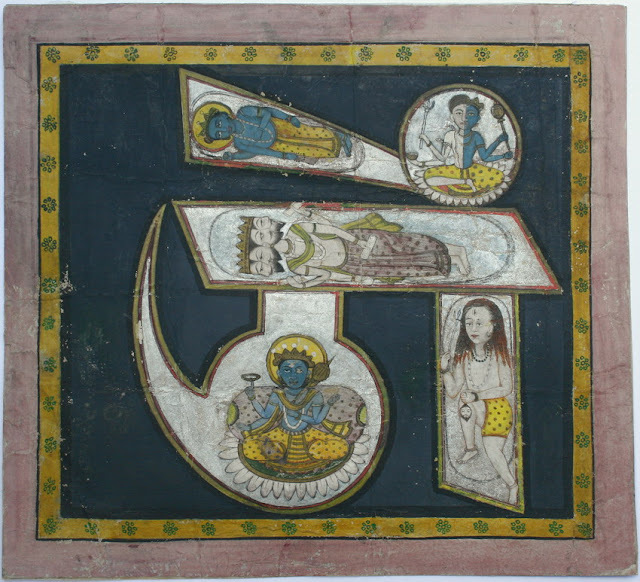 After the time of the Haṭhapradīpikā (15th-century), inversions were also incorporated in yoga texts as āsana. For example, the 18th-century Jogapradīpyakā teaches viparītikaraṇ āsan ('the pose of inverting the body'), which is similar to a modern day shoulderstand (i.e., the head and neck remain on the ground). Headstand is described as an āsana in various texts of this period under the name kapālāsana or narakāsana. Also, the types of inverted āsana become more varied. One such example is viparītanṛtyāsana ('the pose of dancing upside down'), which is a dynamic pose from the 18th-century Haṭhābhyāsapaddhati. It is described as dancing on the hands while keeping the feet in the air. Having supported [oneself] with the palms of both hands on the ground, one should dance on the hands while keeping the tips of the feet lifted [in the air]. This is the pose of dancing upside down. The image seen above is an artistic representation from the 19th-century royal digest named the Śrītattvanidhi. This topic (and more) will be discussed during the Keynote Session featuring Dr James Mallinson and Dr Jason Birch at the international academic conference 'Yoga Darśana, Yoga Sādhana: Traditions, Transmissions, Transformations' to be held in Krakow on 19th - 21st May, 2016. "Each of the texts that is to be edited in the Haṭha Yoga Project (HYP) is a worthy object of study in its own right and is described in detail below. They include the earliest text to teach any of the practices of haṭha yoga (Amṛtasiddhi), the first text to teach a haṭha yoga called as such (Dattātreyayogaśāstra), the first text to teach physical practices for the raising of Kuṇḍalinī (Gorakṣaśataka), the first text to combine the practices of the tantric and ascetic yoga traditions (Vivekamārtaṇḍa), the first Nāth text to call its practices haṭha yoga (Yogabīja), the first text to attempt to combine haṭha and rāja yoga traditions (Yogatārāvalī) and the first text to describe individually each of the 84 āsanas (Yogacintāmaṇi). The most recent of the texts to be edited, the Kapālakuruṇṭaka- haṭhābhyāsapaddhati, scans of the single known manuscript of which have recently been obtained by Birch, is of particular interest for scholars and practitioners of globalised modern yoga: various features of it (on which see below) suggest that it might be the lost “Yoga Kurunta” from which T.Krishnamacharya took much of his teaching. Krishnamacharya’s students include B.K.S.Iyengar, T.K.V.Deshikachar and Pattabhi Jois, the most influential teachers of modern yoga. It is hoped that through text-critical analysis in combination with Singleton’s work on Krishnamacharya the HYP team will be able to establish whether or not the Kapālakuruṇṭakahaṭhābhyāsapaddhati is indeed the same as the Yoga Kurunta."